Five years ago, when Connor was just a baby, I got a job working outside the home -- with an actual salary and everything -- using the oldest trick in the book. I was sleeping with my boss. Of course, the fact that my boss was also my husband made it less shameful. And to hear him tell it, my writing experience was the biggest factor in his hiring decision. Either way, I got the job, and for a time, I went into the office every Thursday and played like I was a grown-up. (I even wore real clothes! Cute clothes! Without spit-up or PB&J on them! And I went out to lunch with my boss without a diaper bag. It was like a date. Only we were working!) The rest of the time, I worked from home. Ideally, that meant I worked while the kids napped. In reality, that meant I occasionally locked screaming, crying children out of my office and hid in the closet so I could finish a conference call. It was tough. Much tougher than I thought it would be. Working from home meant I could continue being a (mostly) stay-at-home mom while simultaneously earning an income. But it was like trying to balance a bucket of sloshing water on a tightrope. But Mary's book isn't just about balancing the family-work continuum. Being a successful entrepreneur herself, she covers important topics such as developing a successful business philosophy, setting realistic goals, dealing with demanding clients and maximizing your profits. To be honest, I signed up to read Mary's book because blogging feels like an at-home job to me. (Only I do it without getting paid! I'm that dedicated!) I wondered how many of her balancing principles would apply to a person like me, who tries her darndest to balance the roles of "Mommy" and "writer." The answer? There's a lot of crossover. Balance is balance, whether you're working for a boss or for your own satisfaction. But I found this book has so much more to offer; it's really designed for someone who wants to make money with their at-home career, whether it's someone with a home-based business (like Creative Memories or Pampered Chef) or someone with flex benefits at their corporate job that allows them to work from home instead of their cubicle. 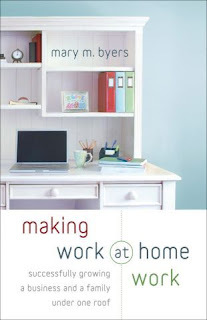 To that end, I have a copy of "Making Work at Home Work" to give away. My only request is that the book ultimately goes to someone who works from home. So in your comment, tell me about the person who needs this book -- be it yourself (because you run a home-based business) or a friend who works from home. It will be interesting to see what kind of at-home businesses are represented. I'll leave comments open until next Thursday, May 21. The winner will be announced the following day. And now I'm off to deal my new boss. She's about 22 pounds with a curly mop of hair, and right now, she's needs to be fast-tracked to a clean diaper. That's one of the best practices of a stay-at-home mom. Now that I'm "home full time" with the kiddos, I'm loving not having to hide during conference calls in hopes that Sesame Street being on somehow prevents them from running into the office screaming "I NEED TO GO POOOOPY!" That said, I have picked up a few freelancing gigs recently, and would like to juggle a bit more as time allows (ha! as if!). So I'd love a copy of the book. Well I work from home part time and part time in the office- as an administrative assistant. If we move, who knows what will happen. I may be able to just be a mommy- or I may need to find a new job working from home. Working from home with one child was easy- now that number two is here- who knows! Anyway, nearly every week at our church small group, my prayer request is for balance. Now that there's no napping, the focused work time is rare. I am blessed enough to have around 8-12 customers who all work from home as well and are very understanding. I would love to have the book for my daughter. She is trying to start a monogram business at home. She has an 18 month old and is pregnant. with #2. Nope, I don't think my blogging counts as working from home. But one of my closest friends DOES work from home and I'd be happy to give it to her. She's juggling. A lot. Well, I'm a tech writer and I work from home 40 hours a week - about 25 during the day and 15 at night - and have been doing it for seven years. I have a part-time nanny - it's the only way I can ensure I'll have enough time to get my work done. I'd be very curious to read the book and see what pointers she has! My sister-in-law used to be a high powered executive and has decided to try her hand at her own ventures. From home she is trying to set up a chain of wellness centres in the US. While she waits (and waits) for investor support, she works as an HR consultant, runs a web-based referral business and sells high end security devices. Plus all the mom stuff. She could use the book. And a nap. I work both part-time outside the home and part-time at home. This book grabbed my attention instantly. I am looking to find balance between spending every waking moment working (either at one of these jobs or taking care of Anja) and actually taking time for relaxation. Oh, and I'm a photographer. I don't work from home now, but I plan to start in Aug/Sept after we move to Denver. Any help would be much appreciated because I need help with time management as it is, never mind throwing work in the mix! Thanks! My husband and I both work from home. We run a small software company and have been doing so for the last decade (yikes!) Oh, we do have a real office (and an employee who misses us). But I had terrible morning sickness last fall and starting needing to lie down at unpredictable times, so I stopped going in particularly often. And then munchkin was born and hubby wanted to stay near "his girls". So he pretty much goes in on pay days or for meetings at the moment. I'm theoretically on maternity leave, although doing some "light" work now (mostly stuff that can be done one handed with a baby balancing on my other shoulder). Obviously I'm not hugely productive at the moment. Most of our customers were already aware that we can work from pretty much anywhere and know we just had a baby. But the whole conference call thing can definitely be very tricky! I'm eager to read this book! I've been doing random freelance graphics/writing stuff for a few years now and still can't get any sense of balance. I'm lucky that I have really loose "deadlines"... except what usually happens is I'll get an email asking how it's coming along (read: "What the heck is TAKING you so long?!") and I'll put in a movie or six and scramble to get it done so I can reply and say, "Ta-daaa!" Right. I'm sure they've figured me out by now. Anyway, I seem to be compiling a nice little list of titles to read. Adding this one right now!